This past July, our family spent a week in Manzanita with grandparents, cousins, an aunt, an uncle, and a couple of very cool teenage girls. There was good food, uproarious Uno games, cold swims, glorious sunny kite flying, and a dozen people sharing one house. Just a few weeks earlier, our daughter Adara had completed her second year of NWDSA Bike First Camp. 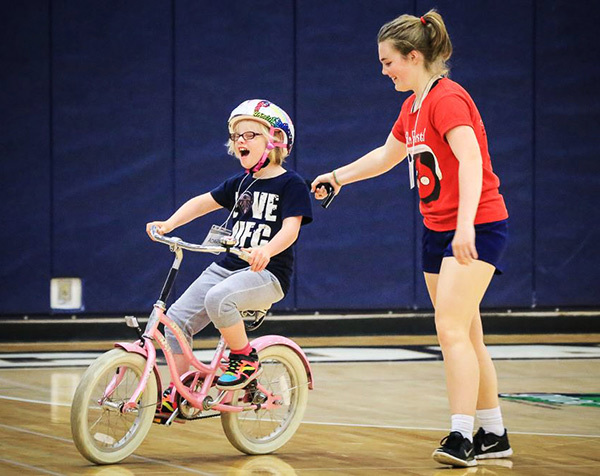 She put impressive effort into getting on her bike and riding around the gym every day, belting out Let It Go with her favorite spotters, and ending each day with a spring in her step and a new confidence. At camp’s closing ceremony, Bike First camp founder Ann Donaca-Sullivan congratulated each biker with a trophy and a smile, and exhorted parents to make sure that we got our kids up on bikes every day for 30 minutes for the next two weeks in order to cement the skills they learned at camp. Our family failed mightily at this task; our house is miles from anywhere, our driveway full of potholes, and the road out front littered with sharp stones, barking dogs and cars that drive too fast. Adara’s bike gathered dust in the garage for the three weeks between camp and our trip to Manzanita. Not even knowing if she’d want to ride, we packed her bike, along with ours, into the truck and headed to the coast. As anticipated, when the cousin energy ramped up on Tuesday morning, I needed to get out of the house. Remembering Manzanita’s great little bike path, I pitched the idea of a family bike ride to the kids. Our son Corwin was eager, Adara willing, and so we headed off—Corwin and David in the lead, me on foot holding the training handle on the back of Adara’s bike as she peddled her way along. There were many false starts as she remembered the tricks she’d learned, and remembered to trust her mother, but in time we made it to the park. And let me tell you, that was one proud little girl, whipping off her helmet and greeting her dad and her brother. And when she was done playing, we hooked her bike to an attachment on the back of David’s bike, and the three headed off for home, while I enjoyed a lovely solo walk back to the beach house. And so a daily routine was born. Most mornings during our vacation we would pile onto our bikes and head to town for a snack, or to the park for a round on the monkey bars. Suddenly I understood the magic of the “destination rides” that Ann and the Bike First instructors talked about at the end of camp. Riding to somewhere is way more fun that riding around the driveway! Adara has never been an eager—or fast—walker, so human-powered outings have always been very limited in distance and time. But with wheels under her, the horizon stretched farther ahead than ever, and we were able to explore in a whole new world together. Her dad and brother could bike at their own pace, and meet us at our destination, while Adara and I made our own way. We sang silly songs, told adventure stories, and played the longest, most detailed game of “I Spy” that I have ever enjoyed. She was curious about the hole the Public Works guy was digging as we passed, so she stopped and asked him what he was doing, and we got an impromptu demonstration of dowsing. We stopped for blackberries, peered into the windows of houses we passed, and critiqued golfers’ swings. And by the last ride, after a morning rain, Adara was on the lookout for puddles, peddling through them as fast as she could to make the biggest splash. The week at the beach was lovely for all sorts of reasons, but the joy and freedom provided by the skills we learned at Bike First were a definite highlight. Hats off and an enormous thank you to Ann and her incredible crew of volunteer spotters at Bike First for bringing this bit of delight to our family and so many others.